This article is about @Page and all the different kinds of pages which come by default with ASP.NET Core 2.0 template. I hope while working on Razor pages, one thing you have noticed is @page. Let’s say you added a new page (named Sample.cshtml) in Visual Studio Code in your existing application. Once the page is added, we will get an empty editor window on the right side pane where we are going to write code for our page. Now, save and run the application. 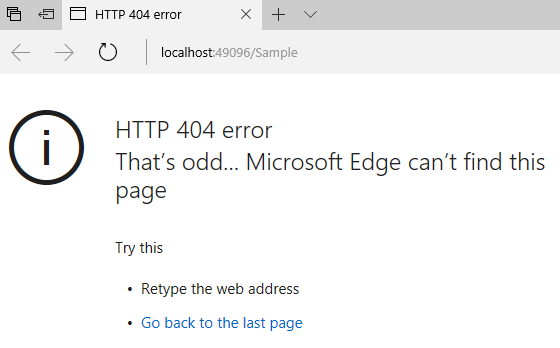 Oh -- 404. Any idea why we end up looking at such a weird page? Well, @page is holding this magic. Basically, none of the Razor pages will be considered as pages until and unless they are decorated as @page in the very first line. But as soon as we append the @page in our newly added Sample.cshtml page, things will work as expected. Next, we will quickly look at a few of the files which are added by default under a Pages folder with some pre-specified lines of code. This file contains the code which runs for every View. 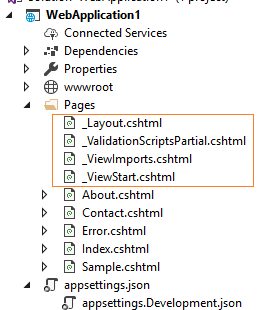 By default, it contains only 1 line of code as shown below, which is showing the layout page for every page. This file contains all the namespaces which are to be used by every view. So, rather than adding same reference on top of each and every View, it can be moved to _viewImports.cshtml. By default, this file contains the below lines of code where WebApplciation1 is the name of my application. asp-fallback-test="window.jQuery && window.jQuery.validator && window.jQuery.validator.unobtrusive"
This file is for layout of the application and contains a lot of code which is required to create a layout for our application. The most important method in this file is @RenderBody() which embeds other views into it. I hope you enjoyed reading about Pages.